Karol Rudyk is no stranger to this website, and in fact I have done a full interview with him in the past. 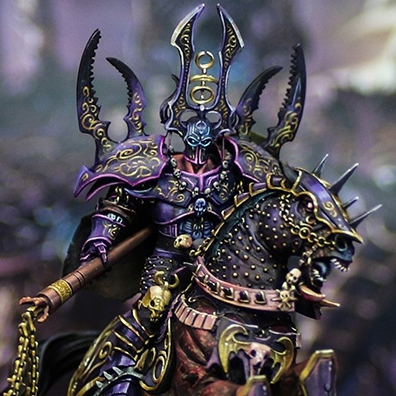 This multiple Slayer Sword winner continues to turn out truly stunning models, like with this Slaanesh Chaos Lord. Anyone familiar with the artwork of Adrian Smith will instantly recognize this. I think it first appeared in the 6th edition Warriors of Chaos army book, albeit in a black and white format. The lengths that Karol has gone to reproduce this art in miniature form is really amazing. 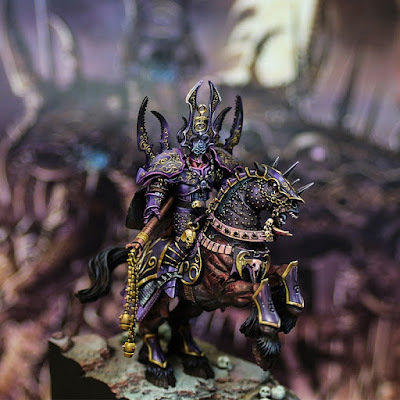 You can make out the "old" Archaon model beneath all the sculpting, but mostly just by the horse's pose. The sculpting on this is crazy good, with some super fine details add on. A lot of it is actually flat though, leaving him plenty of space for freehand. That's right, most of that filigree is freehand painting. Everything is as crisp and smooth as you would expect. I'm particularly pleased to see how saturated the colors are. He has forgone the desaturated look that's in style now to really embrace the boldness of the art it's based off of. It never looks cartoony though. It has the perfect balance or bold and realistic, in my opinion. I don't know what more I can really say about this, it's pretty dang amazing. I would highly recommend you check out the link to Putty and Paint to see the rest of the views of the model, including an unpainted version where you can see all of the sculpting work that went into it.